One of the major pitfalls of a CRM system comes is having a large number of inactive contacts. In some cases these contacts are nowhere near your sales pipeline, creating essentially, a dead database! The task of manually trawling through all of these leads to establish who they are and if they’re interested in your company is extremely draining from an admin perspective. Wouldn’t it be easier if you could manage all your contacts in groups!? Well now you can, with our improved ‘Bulk Updates’ tool! Our impressive ‘Bulk Updates’ tool allows you to easily select single or multiple contacts in one go and set a Next Action, Mark Next Action Complete and/or Delete Queued Actions. The Bulk Updates menu appears at the top of your Action Stream after you select your chosen contacts. Once this is selected you can click on the ‘Actions’ option to apply the Bulk Update changes to these contacts. Take a situation where you hire a new salesperson and you need them to hit the ground running. Ideally, you will be able to assign the first batch of leads in one go to get them started. This is where the Bulk Update tool comes in! 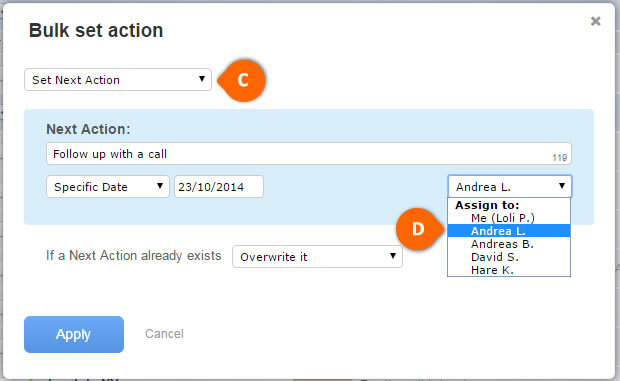 Select multiple contacts at once and simply set a Next Action from our drop down menu (See C). Assign this Action across all of these contacts to the salesperson (See D). For instance, ‘Follow up with a call’ now means they have a readily available “to-do” list right at their fingertips. Set Next Action: Typing in your Next Action and setting a date brings contacts into your Action Stream. Allowing you to keep working in a logical order. If some of the contacts already have a Next Action, you can leave them as it is – ‘Don’t apply the new one’ (while assigning to those without or changing dates for contacts with existing Next Action), ‘Overwrite’ it, or create a ‘Queued Action’. You are also able to assign actions to another user in your account. Mark Next Action Complete: This provides the opportunity to mark the Next Action complete for multiple contacts or to close the sales cycle with or without a closing comment. Closed contacts and contacts without a Next Action are placed at the bottom of the Action Stream. Delete Queued Action: It is possible to delete Queued Actions for contacts regardless as to whether it is you or another user that these actions are set for. 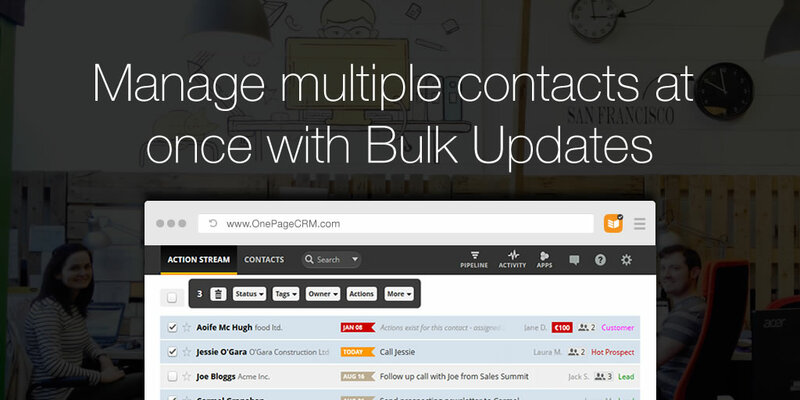 The Bulk Update tool within OnePageCRM means that you do not have to manually trawl through large lists of individual contacts setting an action for each. Now, you have more control over assigning tasks for yourself or members of your sales team with minimal admin required. This makes it easier to focus on converting your leads to customers. If you need more information or wish to learn more about using the Bulk Update tool in OnePageCRM, you can find our help article here. You can also contact us directly at support@onepagecrm.com, or comment below! can you set a system that logs-in the number of sales calls made, number of meetings set, and a few other basic metrics? Hi Yannis, pleased to let you know that our Dev Team are working on this feature as we speak, should be live very soon. I’d also recommend using your status labels to help you implement a workflow as you can see your prospects progress through the different stages. Thumbs up on the basic metrics! I like that. Thanks for the feedback Chad, glad you like it!